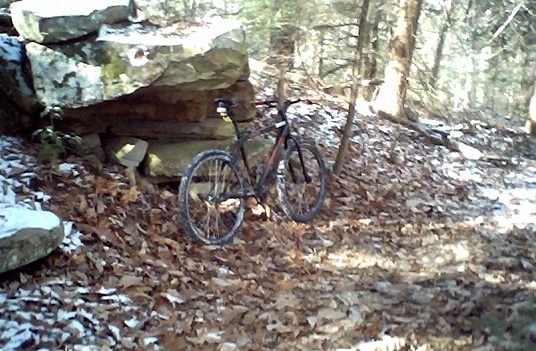 My 99 Specialized Hardrock was long replaced by a Stumpjumper...so it sat...even rode it around with babyseat at one point. What started out as a "hey son, lets take my old bike apart turned into a project...the pics and the ride were worth it but could have bought a brand new bike. 32/16 - there was a lot of stuff that had worn on the bike...bottom bracket, brakes, cables - you can't just put that stuff back on and expect to be happy with the project...but you're right about the fun. I am seeing derailage in you future. That chain has a lot of slack. 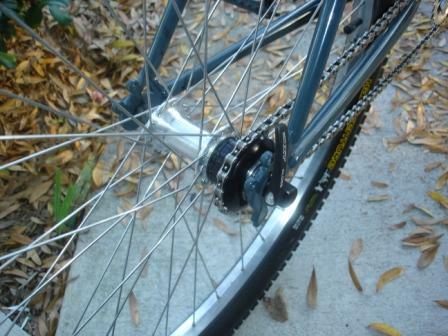 Either buy a new chain that is not stretched (which may or may not fix it) or get a tensioner of some sort (old derailure or after market tensioner). Other then then that thow on some clipless pedals and a suspension fork and you got a great ride, but those are personal preference. chain - the sproket is part of Wheels Manufacturing SSK3 kit that has the two guides on either side of the sprocket...the chain hangs looser than I would like it to...but it won't derail - I might look at a eccentric bottom bracket...I got rid of the front suspension - to heavy for the $$$ i wanted to spend. 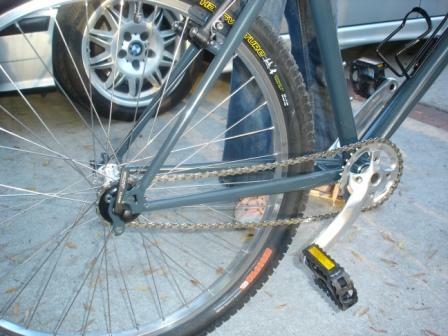 It might not derail off the back, but you can still toss it off the front especially if your chainline is not spot on. I can not tell if that is a geared chainring up there or not. As far as the eccentric bottom bracket goes, you will have to cut out your shell and have a welder (or weld it yourself) put in a new bottom bracket shell that will do the job. Nice looking bike though. Enjoy the ride. bigger bottom bracket housings? That's not worth it...we'll see how it goes - I really want to avoid any kind of tensionor - it is super smooth right now. i know what you mean,but for me,1/2 the fun is chasing down the right parts,then the feelin of pride when yer out ridin it,knowin you did it yerself.the only ss i have up and runnin right now was sort of a project,i bought it used as a frame/fork and included 1 wheelset,1 extra pair of hubs and a set of 1.5" slicks (and maybe a stem).it's my favorite bike tho it was a badget build...the only "expensive" part was the new truvatin husefelt ss crankset/bb,and that was only around $175-200.heres a pic on a recent ride,she's and 03-04 monocog. You might consider an ENO hub, but that's probably worth more than the whole bike. Yes, the larger housing is a EBB housing. An EBB will not fit into a standard housing. You can however go with a eccentric hub such as the White Industries ENO. I love it... vintage, rigid, and SS. What more could anyone ask for ? We just did the same thing! 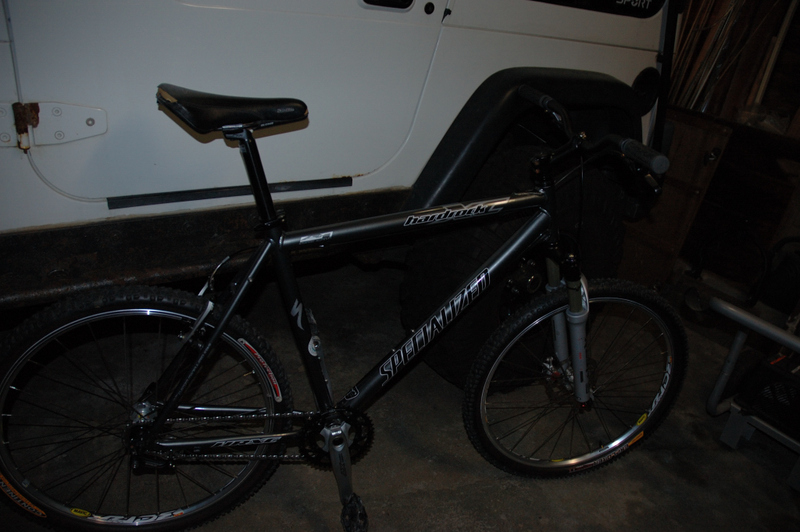 My son (2 and a half) just got my best bud an '04 hardrock frame in return for buying him a Trek jet 12" bike for his Birthday (one good turn and all that! )...we built it up and used a Surly Singleator, but you could also look into a half Link Chain (shadow Conspiracy makes one IIR as well as a few other companys...) Aside form the cockpit that we pulled off an older Hardtail I had in the garage, Tom bought all new components (eBay and local shops)...he easily spent more than he would have if he'd just bought abike off the shelf...But he can say teh Frame was a gift from my son, Liam, and that is worth it for him. Ride on and enjoy every second on it! 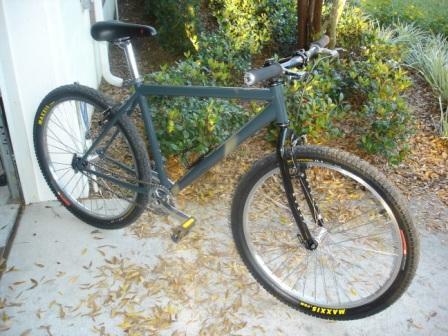 My son's Christmas present was a new mountain bike and he chose to build up an SS. A friend donated the frame ( a Miele UA 150), I bought a handful of parts, and we salvaged the rest from his old ride. He loves the bike and says it's like riding a BMX on steroids. I would seem that there should be plenty of chainrings that have just enough variability introduced in the depth of valleys and height of the teeth to accomodate almost any tension requirement without needing EBB or hubs or tensioners.